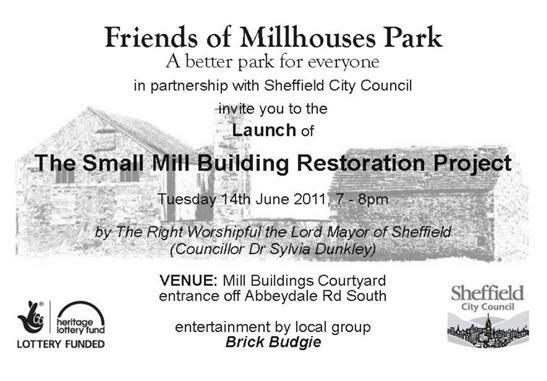 We will be meeting from 7 pm in the Mill Courtyard, be entertained by our own Pete Brown and the group in which he plays “The Brick Budgie”. Have a look round the 1000 year old site, inside the old buildings, see plans and idea, meet the movers and shakers and, perhaps, a few surprises. Heritage Lottery Fund have awarded us £50k to get the building secure and we have another £100k to raise to get the small building back into sustainable community use. From 8 pm we will move over the road to the Robin Hood to socialise and mingle. We have put in 3 years work to get this far and now we need the funders, politicians and Officers to see the community coming together so please do turn up and be seen. It does make a difference. If it tips it down with rain then bring an umbrella and good shoes – we will carry on.